When Mr. Kipling, the world famous author, comes to live in a house near Kitty’s family farm, she is full of questions and wonderings. Of course Kitty if often full of questions, to her father’s annoyance, and he is often telling her that "curiosity killed the cat" as a warning to her not to be so nosy. Still Kitty cannot help wanting to visit the Kipling house and soon she gets her chance to do so. The place itself is fascinating but Mr. Kipling is even more so and best of all he tells wonderful stories. He also encourages questions and never tells Kitty to stop asking them. Kitty cannot get enough of Mr. Kipling and his family and she goes over there as often as her parents will let her. It is such a wonderful place, a magical place. Then things start to go wrong in the Kipling home and Kitty’s curiosity is stilled for the first time in her life. All too often the news from the house is bad and with all the neighbors talking about the goings on and with reporters badgering everyone for news, it is a terrible time for all. Based on the true story of Rudyard Kipling’s four years in Vermont, this is a story which touches on the life of a quiet man who loved to tell stories, who adored children, and who did his best to do the right thing by his family. 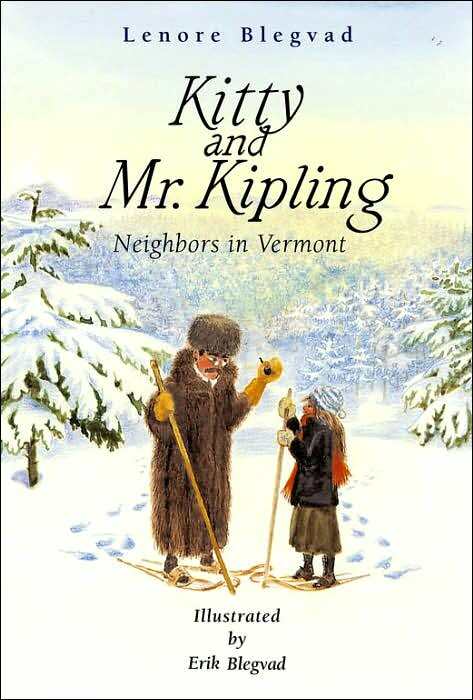 It does not discuss the many controversial aspects of Kipling’s life such as his racist and imperialist views though that side of his personality is mentioned. Through Kitty’s experiences we can see that it is possible to separate Kipling from that side of his life and look at him as a father and husband, a storyteller who was seeking a home where he could have a quiet life. Though there is much sadness in this story, there is also happiness, growth, and wonderful memories that would last a lifetime.